When I first picked up the Mercian 101 hockey stick I was immediately stuck by how light it is. Personally I choose “medium” when I buy a hockey stick because I like a little oomph to support my aging arms hit the ball. Conscious of it’s light feel I thought I was going to find the Mercian 101 hard work to get any real power from. How delighted I was to find that the hockey stick knocked the living daylights out of the ball, especially improving the power from slap hits. Why was this I wondered, then researching Mercian a little deeper I found great information about the weight reduction they are achieving from all of their range, which helps the Mercian 101 to be one of the lightest and firmest hockey sticks I’ve had the pleasure of playing with thus far. You might have experienced Mercian’s website in your research of the 101 hockey stick. I have certainly commented on it before. The thing that stands out is their addiction to materials. Of course it makes sense that a composite hockey stick will be beholden to the materials used, Mercian take this to the extreme. The Mercian 101 hockey stick has a 70% carbon fibre content and it’s the quality of the material that makes the stick. Mercian source British material where possible and the carbon fibre in the 100 series and specifically the Mercian 101 hockey stick is of the highest quality. This high quality carbon fibre is in most part, responsible for the balance of light and firm. With additional reinforcement using Kevlar branded aramid (again, regarded the highest quality) it makes a non-elite hockey stick a great performing beast. Don’t be fooled by Mercian own description of the 100 series, the 101 does create plenty of power on the ball. More than enough power for anyone who is not an international player. Because of its lightness the Mercian 101 is also extremely maneuverable. I would put it forward as one of the best defenders hockey sticks available in the intermediate range. 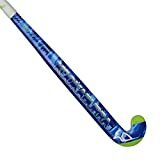 By combining a light hockey stick that feel strong enough to challenge with it will give defenders control and confidence against their attacking opposition. Aside from its lightness its important to review the Mercian 101 hockey stick’s shaft bow and balance. Both of these attributes assist players to control the hockey stick when dribbling the ball and making defensive moves. Though it uses the full limit of the regulations with a 25mm curve, the Mercian 101 has a mid shaft bow position. This gives a great balance point higher up the stick and contributes to the hockey sticks agility. The obvious curve in the Mercian 101 does feel significantly more obvious than other standard bow hockey sticks. While some brands standard bow is a smoother more arching bend down the shaft, Mercian standard bow used in the 101 definitely takes a distinct curve. It is not however a low or late bow. At 225m up from the ground it’s low and therefore a good move for anyone looking to take advantage of the benefits of a low stick but not an out and out drag flickers dream. Really it is not supposed to be and the position of the bow is a great challenge. It give some versatility for a defensive or midfield player who wants to be able to throw aerials while maintaining dribbling skills and tackling power. We love the Mercian 101 hockey sticks design. In the 100 series of sticks the colours are distinctly shinny, I think they call it glossy. The 101 has a great smaller than some, version of the Mercian bat like logo on the back. With it’s sleek black look combined with rich gold detail the Mercian 101 looks stylish. Personally for the money I think it would be nice if Mercian could add their VRZ ‘Vibration Reduction Zone’ to the top end of the 100 series. Read any of my reviews of the Pro-Line series for more information on that mind-boggling technology. This is really because the most likely player to experience vibrations is one who occasionally catches as much ground as ball and VRZ would help. However it’s not a massive deal, if you hit the ground then you can expect a little kick back from the stick, more practice needed. Mercian have a great mid-range stick in the 100 series and the 101 with its high carbon content, light feel and big power is a great hockey stick for good club players. Yes it works for an attacker but the shaft bow and balance combine perfectly for a defender. Like me, if you buy British to ensure quality you will not go far wrong with the Mercian 101 hockey stick.